PIOMAS (non) Verification II | Watts Up With That? In my previous PIOMAS verification piece I noted that PIOMAS volume trends don’t correlate with extent trends over the last three years. PIOMAS has gone down since 2007, while extents have increased. The diverging trends themselves prove nothing, because it possible (but unlikely) for it to occur. This time I directly compared calculated volume measurements, which should be more definitive. In their current graph (below) PIOMAS shows a record negative volume anomaly. This appears to be incorrect, because we can see from the PIPS blink maps (below) that thicknesses were generally lower on this date in 2008. If the visual impression is correct, it would be impossible for the current anomaly to be greater in magnitude than the 2008 anomaly. Quantifying this further, I numerically integrated May 31 pixel count vs. thickness since 2000. As you can see, May 31, 2010 volume is currently higher than any year since 2006. It is also higher than 2003. Remember that 2003 had the highest minimum of any year in the JAXA record. So why does PIOMAS show a record volume anomaly at present? Something is wrong either with PIPS maps or published PIOMAS volume data. PIOMAS trends are widely quoted and it is important for them to be correct. Willis has also made some interesting observations. June 1, 2010 in Arctic, Sea ice, Uncategorized. Well, Steve you were wrong about Venus, but do not let that stop you here. The CAGW forces MUST have declining ice (area, volume, or thickness or any other kind of numbers) declining to keep their religion (er, science) alive. No other result can be presented. Why are you so desperate to change the subject? Concentration is also higher in 2010. Your argument works against you. Also, the PIPS link you provided was pre-2008, and agrees with the chart in this article. Why did you think that pre-2008 data would contradict my post-2008 claim? BZZZT! Bad logic, Jacob. Whether or not Steve was right or wrong about some unrelated subject is immaterial and meaningless about whether Steve is right now. What, you’ve never been wrong about one thing and right about another? That’s why they don’t allow testimony about “prior acts” in trials. All you have done is revealed your prejudice. Your puerile attempt to poison the well has failed, give it up. However, you are welcome to present any scientific data or arguments to show that Steve is wrong. That’s how science works, not by personal accusations as you seem to think. And see a PIPS 2.0 version for the same date. Wow, a HUGE difference. Why? Well for one, PIPS 2.0 is defunct…inaccurate…and doesn’t use CICE (like PIOMAS does). You are a smart guy Steve…brilliant even, so why can’t you see that the PIPS 2.0 data is wrong? If it was so accurate, why would the Navy have moved on 5 years ago? I’ll let readers make their own assessment of your analytical abilities here. Exactly how, or where, was he wrong again? Could you make a detailed explanation of where he is wrong instead of referencing a book with no text? Maybe you should’ve read his entries a little more thoroughly instead of relying on your own capability of inference. You may recognize me as one of Steve’s critics, and hopefully as someone who shies away from ad hominem comments. 1) Just because something is on the web (from a book, even) doesn’t make it right. A while back, someone did that, referring to a little spot written by a scientist. I contacted the scientist about it and he fixed it the next day. Hard to do that with a book, so I won’t bother. 2) I find it really rude when a new post goes up and the first comment is some OT crap by someone who can’t get attention any other way. Congratulations, you are one. 3) At its best, a scientific argument relies one’s own data and understanding, and serves to increase respect for that person and his views. There’s nothing in your one line comment that does either. not 6) I don’t agree with Willis’ paragraph 3 – a Venus discussion doesn’t belong here. It belongs on a Venus thread. Therefore, I will have no more to say here. It appears the controversy is over a discrepancy between what are really just two computer models? Perhaps we should wait until we can get some real data from CryoSat-2, unless there is some other reliable ice thickness record somewhere. Nah, what’s absurd is we were arguing this at an older article and you felt the need to restart it over here. BTW, WILL YOU STOP TWISTING THINGS AROUND? I even saw one post suggesting that PIPS 3.0 was never implemented, and so the Navy went back to using PIPS 2.0. Bud, stop warping things around. I never denied 3.0 was being developed, I said it wasn’t yet deployed, they were still using 2.0. THE FREAKING US NAVY SAYS 3.0 is in final development. Fine. Keep calling the US Navy a liar. Keep up your little self-amusing war, twisting people’s words and moving your fight to new venues when you’ve lost the battle. Keep on looking like EXACTLY what you really are. Wouldn’t have it any other way. R. Gates, your comments appear to be wishful thinking. The truth is that ALL of the ice estimates are based on spotty data and none of them should be viewed as anything other than SWAGs. Even if one of the estimates of volume is better than another doesn’t mean the ice will behave in any particular way this year. Still another month before we begin to understand how the weather will control this years melt. Since I started this PIOMAS stuff, let me first thank you for getting a Second VOLUME measurement – – albeit it seems to be ONLY, as I have said before, concentration presented as thickness. Technically this means it is a good measure of RELATIVE thickness, as where there is 99% concentration = open water of 1%, you can bet the ice is thicker than other areas. BUT 30 years of thinning Ice since 1980 did not reverse overnight: it IS VERY POOR to use it for the TOTAL of the whole Basin. That is why the Navy never summed it up into a Volume … but it is STILL OK to use for an Icebreaker – – it tells you where the Ice is THINNER. My “Doomsday” calculation was getting me down because it was the ONLY Volume calculation (Present El nino =1.8 over 2007’s = 1.1 … times 2007 loss of Ice over 2006 = 4000km3 …. thus we lose 6545 km3 which is more that last years’ minimum BY PIOMAS) – – at LEAST someone has finally seen we need SEVERAL Models, as the many for area. I’d be happy to do historical comparisons using PIPS 3 – if they existed. Clever, but please, no ad hominem crap. I don’t see any relevance other than a lame pun. Try over at RealClimate. You have proven beyond a shadow of a doubt that people with no training or experience in science have an awfully hard time doing science. Since you do have some journalistic background (don’t you?) why don’t you contact the nice people at the Polar Science Center and ask to interview them? Maybe you could even visit them for a few days. Just a thought. PS: Have you read the several papers they reference to understand how they do their work? Kwok, R., G. F. Cunningham, M. Wensnahan, I. Rigor, H. J. Zwally, and D. Yi, 2009: Thinning and volume loss of the Arctic Ocean sea ice cover: 2003-2008. J. Geophys. Res., 114. Maybe, just maybe, they know some things you don’t. In a few weeks it will become clear if their model is accurate. Oh, July 1 can’t come quickly enuf. . . I suppose the heartening thing about this furball is it is a 4-month furball, max. At least the skeptics are willing to stick their necks out with falsifiable predictions in the short-term. Good luck getting an AGWer to agree to falsification criteria for their predictions *at all*, even over decadal time-frames. Is it even possible to estimate ice volume? The AMSR-E graphs are pretty conclusive that minimum Arctic ice extent cannot be predicted. I liked the recent post that wind currents played a dominant role in summer ice extent. A very plausible theory. Do we even know what the Arctic wind currents are/were/will be? Enough to predict summer ice extent? No – not even close. Global temperature, ice extent, ice thickness? We have no idea. Climate Science seems silly most days. Thanks for continuing to point this out. Steve, I am not desperate to change the subject, this analysis of yours is wrong as well. The comment I made about being wrong about Venus has to do with an issue of credibility. Steve has been consistently wrong about several issues relating to climate and the effects of greenhouse gases. In a court of law credibility is a very important issue. The Google book reference I left does have text, so that is incorrect. Venus developed closer to the sun and with less water there was less ability to absorb excess C02. The cool thing about WUWT is that it looks the data – unfiltered by other people’s misinterpretations. People using one of those old fashioned aeroplane things to measure the thickness of the ice. In this case they compare winter 2007 with winter 2009. 2.8 m at the North Pole”. They suggest that weather conditions in 2008 were fairly gentle on the ice so there was less compaction and deformation of the ice. Much of the new ice since the 2007 low is still very flat. I wondered how this flat (but thicker) ice compares with the folded (but thicker) ice when seen by a satellite. Anyway it’s worth a read just because its one of the few Arctic papers that doesn’t push a catastrophe. 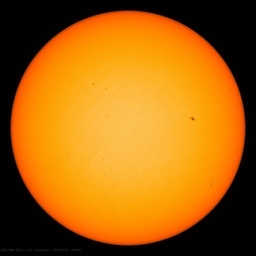 By no means is it anti-AGW it just doesn’t go beyond the data in it’s conclusions. Which is the way it should be. It’s worth mentioning that after the 2007 minima they published a paper in GRL using their model to predict the 2008 minima. In that case they predicted 2008 extent would be smaller than the 2007 one. They got it wrong then. I agree with Steven, there are mathematical errors with this model that must be caused by the drive to prove AGW and to motivate the grant-funding agencies that Polar Ice Centre research and modelling is something that needs to be funded. It is clear there has been some reduction in the Arctic ice extent. It is clear there has been some loss of thicker multi-year ice. What is not clear is how much temperatures in the Arctic have actually increased, how much of the small decline is the result of natural variation, what are other reasons for the decline, what the actual thickness of the Arctic sea ice is and why the Antarctic ice seems to be increasing (contrary to the CO2-induced theory for ice melt). Since we have no real volume data to rely on (at all), objective people have to rely on the ice extent and ice area data generated from real satellite data only. The volume numbers are a curiousity only. 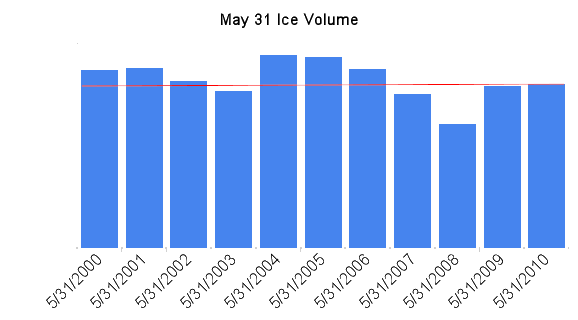 The model used to generate these volume numbers has proven to have the worst ice area and ice extent predictions so that should not give one confidence. Perhaps someone can ask the Polar Ice Centre to provide the data in a form that does not require a Fortran software system since most of us were born after it became obsolete. Area * Thickness = Volume (that formula was around about 3,000 years before most of us were born so it should still work). Yep, that’s why so many of them have had to become expert at the Gish Gallop. Remember that 2003 had the highest minimum of any year in the JAXA record. Good luck getting an AGWer to agree to falsification criteria for their predictions *at all*, even over decadal time-frames. Still, we have a few more days in May, and 2010 has the steepest melt curve in recorded history. I’m going to go out on a limb and predict 2010 breaks through the floor before June. The trolls are coming out. Are they sitting in front of their computers on the edge of their seats with WattsUpWithThat’s front page open waiting for a new post so they can be the first to put up a comment on it? And apparently being on topic doesn’t matter when putting up that first comment. It looks like desperation. Poor trolls. I enjoy people seeing their pathetic tactics. These global warmers can’t seem to stop hurting themselves. Is hurting themselves part of the religion? It is certainly inconvenient that PIOMASS was not able to use ICESAT to verify their model after 2007. The northern Hemisphere ice volume plot on the retro page of the Polar Ice site is interesting. It plots sea ice volume beginning in 1948 against the NAO index. From 1955 to 1969 the ice volume increased by 30% while the NAO plunged. The 2003 low is not too much less than 1955. Darn it when those ocean currents mess up your models. Steve has been consistently wrong about several issues relating to climate and the effects of greenhouse gases. After looking into global warming for myself for 3 years now I find that anyone who says anything other than the hackneyed global warming mantra of co2 bringing disasters to the earth is considered to be wrong by people of your ilk, Jacob Mack. ironic that you’re referring to credibility as being important. So far here, you have absolutely zero. At least Steven is presenting the evidence; you’ve presented none. That’s a sure way to lose a court case. Funny that some people think that volume continues to decrease since 2007 while extent continues to increase since 2007. Must be that new math….. I note with interest that 8 of those 9 papers you cited included Zhang as an author. Only 1 paper was “independent”. Maybe. So, if a person is quoting himself and investigating himself and then using his own theories to check his own models against his own assumptions and simplifications to change (er, correct) his his own data to support his own pre-conceived image of the world and the CAGW mindset he must claim to continue his funding power and influence ….. who is checking the incestuous writer? We don’t know. The editors refuse to tell us. It is easy to believe based on the sea ice volume low in 1955 that in the period from 1910 to 1920 the volume must have been much less than today. And scroll down to page 34 (labelled as page 27 on the PDF) you’ll see a sample of PIPS 3.0 sea ice thickness for March 15, 2008. North Pole on March 15, 2008.
certainly makes it seem like PIPS 3.0 is up and running somewhere. The Internet is huge – I wouldn’t be surprised if someone finds a bunch of papers discussing the new PIPS 3.0 ice thickness data later this summer, after people at WUWT get comfortable using Navy PIPS data for working with Arctic sea ice thickness. After all, Navy PIPS data is reliable, trustworthy and verified. Expensive submarines depend on it’s accuracy. AGW skeptics know that the US Navy has no political agenda, unlike those liberal professors at University of Washington. This article has been published in Oceanography, Volume 15, Number 1, a quarterly journal of The Oceanography Society. Copyright 2001 by The Oceanography Society. PIPS 2.0 is based on the scientific research efforts of late 1970s and early 1980s. During the past 10 years (1990s), great strides have been made in understanding sea ice dynamics and thermodynamics as well as observing ice conditions. An additional and very important factor in the improvement of ice modeling and forecast capabilities is the advance in computer technology over the past 10 years. Computer codes now make use of multiple processors and can perform more extensive computations in operationally acceptable time periods. In 1998, the Office of Naval Research (ONR) and the Oceanographer of the Navy via the Space and Naval Warfare Systems Command (SPAWAR) joined forces to fund an effort to combine this new technology and data into an improved sea ice forecasting system. This system, aptly named PIPS 3.0 (http://www.oc.-nps.navy.mil/~pips3) is presently being developed through a joint effort among the U.S. Naval Postgraduate School, various other academic institutions and the Naval Research Laboratory. The PIPS 3.0 ice model will contain an improved calculation of ice growth/decay based on the use of a multi-level ice thickness formulation. Ice edge forecasts will be improved by using higher horizontal resolution. Ice motion and ice edge location will be improved by the assimilation of satellite derived ice drift data. In addition, higher resolution and more realistic ice rheology will improve the PIPS ability to predict areas of lead formation and lead orientation. These improvements to the PIPS 2.0 are being tested in an incremental fashion. Look at the blink map in the beginning of this thread. Not doctored numbers, or false measurements, or half-baked models, or those with degrees in divinity (Gore), or community organizers (Obama), or coal-fired railroad engineers (Pachauri), or pompous know-nothing scam artists (any name here). Regardless of the accuracy of PIPS predictions, their models are continuously updated with available real time data. The complaints about PIPS 2 accuracy are a smokescreen. You are right about the “trolls.” Must be hotting a nerve, eh? The pip 3 thickness map illustrated in the pdf you referenced appears to show a uniform thickness compared to the pip2 data. This seems suspect considering that the polar ice group emphasizes the use of the age of the ice to make thickness estimates..
Based on the clear correlation in the past of the NAO and the sea ice volume. Do you think sometime from 1910 to 1930 the sea ice volume was less than today based on correlating the 1955 low with the NAO at the time? Well, congratulations on a correct prediction in a period when the entire record you’re looking at has less than 5% variation to make a prediction on. May and June just aren’t very interesting for extent. Maybe someday when we have daily volume readings over a long enuf period. If late September is that close to 2006, then Steve will be nearly dead-on and I’ll have been a little high on extent minimum for 2010. The PIOMAS Arctic ice volume graph is off limits, eh trolls? No one was supposed to turn that rock over and see what was under it. The Hockey Stick is broken. PIOMAS ice model is crappy too. You guys just can’t win. I know Venus is OT, but I came across another interesting article about it, referenced in the Wikipedia article on the atmosphere of Venus. Open the html source code ! The PIPS 3.0 is presently going through its final development… –and will begin its adaptation for operational use in 2003 with a scheduled transition into operational use in early 2004. Today there is a flood alert for the Colville River Delta thru noon June 2, as reported on the Anchorage news (KTUU ch2). All due to snow melt. High today on the Arctic Slope was around 38F. Highs first consistently went above freezing last week. There is still a lot of snow in Turnagain Pass (elev +/- 2,500′) on the Kenai even though temps have been more like July than May. Whatever may be happening in the Arctic ice extent or volume up until end May is not related only to temperature if Alaska arctic shoreline observations are any guide. 2008 summer was exceptionally cold in AK, 2009 was warm, and 2010 is starting warm. Barrow temperatures are below normal, below freezing, and they are expecting a few inches of snow overnight. Bill, what mathematical errors do you refer? But your volume measurements are way out of whack with those derived by the Navy team from PIPS 2. Even if the Navy’s model is accurate, your values are not. In fact a comparison of your numbers and the Navy’s for May show a high NEGATIVE correlation, -0.6. On that basis, if you claim the ice volume is increasing, a proper calculation from PIPS 2 may well show the opposite. Be reasonable. If someone sets themselves up in a very public way and acts like (or indeed is) a complete idiot, they are fair game. It’s just a bit of fun, ease up! Yeah I see it. That part you emphasized is what is known as a comment. It doesn’t display, therefore it doesn’t count. First, look at how the comment was done. Looks like an edit, they just chopped off a part and left it there to show what the previous version was. It actually is an old powerpoint presentation dating from around 2005, perhaps 2004, showing “works in progress.” The referenced chart shows 2.0 still operational in 2005, with “Development and Transition” of “PIPS 3.0 (G-NCOM)” in 2005, with D&T of “PIPS 3.0 (G-HYCOM)” in 2008. Heh. Some published pretty pictures from 2002 showing how great the output looks, a web site where the pages have a Last Modified date in 2003, an old powerpoint presentation saying it’ll be finished and installed in 2006… If PIPS 3.0 was meant to be a commercial product, it would have been written off as vaporware years ago. I find the warmist comments here highly amusing – these are people who: i) will swear blind that tree rings are the answer to determining historic climates, and ii) ignore how GISS and CRU have manipulated historic temperature figures. Yet, these same people question one of the world’s most scientific systems for forecasting ice thicknesses because of minor inaccuracies, which according to the references in the posts here appear to cancel each other out. My bet is they work as a minor cog for some government or quasi-government organisation. Steve, why do your ice volume estimates differ from the ones actually published by PIPS2? Are you not actually downloading the thickness data and computing volume as a function of ice area and area per pixel? You have to make sure you are doing the computation correctly if you want to compare with PIOMAS. Both PIPS and PIOMAS are models that assimilate real time data to produce ice thickness. But they are only model predictions, not real data so it’s not wise to put too confidence in them. More actual thickness data are needed to verify both models. There is some data from radar altimetry from ENVISAT that can be used to estimate ice thickness up through present (though it doesn’t cover the entire Arctic). Soon with CRYOSAT more validation will be available that can be used to see which model is more realistic. In the meantime, the ice extent remains the best metric, and given the current rate of decline and the fact that it is now the lowest in the last 31 years, speaks to thin ice that is easily melting out even though Steve continues to point out that SSTs are cold and air temperatures are cold (yet still warmer than normal). Why why why are Anthony etc giving ammo to the trolls on a daily basis by banging on about models and estimates? If we do not trust models as scxeptics, why are we suddenly going down the road of comparing them against each other??? What really worried me is that everyone is ignoring the obvious. Look at the AO/NAO data and compare it to the historical ice levels generally. They correlate. Its the NAO stupid, and its just gone negative. I found something truly impressive. Searched for PIPS info, found this presentation (note: FTP link, not HTTP) that apparently was used for a conference, from NOAA, NSIDC et al. Note on pages: “Arctic Frontiers – Tromsø, Norway – 24-29 January 2010”. No mention of PIPS 3.0, just 2.0, it’s still interesting to look at. In it was mention of an ice forecast system that provided thickness charts, TOPAZ. I Googled, found it… Wow. Beware, those with slow connections. Here is the home page. It has an animated GIF, 8.5 Mb. Here is the animation, if nothing else you MUST download and watch it. From the beginning of 2010 to the end of April, it shows ice thickness. In high resolution. Height represented by a spectrum, not a few fixed colors. You can watch the Arctic sea ice grow, twist and turn, move and flow, like a living creature. Forget PIPS 3.0, whatever it looks like, whenever it’ll show up. It is the past, it is history. I knew that when I saw the specs saying it’ll use SSM/I data when AMSR-E is newer and better. TOPAZ is the future. And the future looks marvelous. Now, can someone explain how to get data from it? The “Latest Forecasts” section is not user-friendly for me. The page says it also has plots for temperature, salinity, ice transport… If only I knew how to get to them! If I remember correctly the so-called ice experts predicted 2008 ice extent would be lower than 2007. They also predicted 2009 would be less than 2008. I suspect the PIOMASS model had something to do with these predictions. It appears they are once again predicting a large melt. Could this be 3 strikes and you’re out? PIPS 2.0 may not be accurate to the actual ice thickness, but this post isn’t a comparison to actuals, it’s a look at the trend indicated by the model. It’s an apples to apples comparison of the model results. AGW proponents LOVE MODELS, all of the predictions of dire future temperatures are based on inaccurate models. So much so, that a group of verifiably inaccurate models are grouped and averaged to form a trend. The PIPS 2.0 data indicates a trend toward greater ice thickness between 2008 and 2010. That is a simple fact, demonstrated by the blinking plot. This is to some extent verified by the reference paper that published increased average ice thickness –from 2.4 to 2.8 m.
PIPS 3.0 data can be compared to other PIPS 3.0 data to evaluate a trend. All you PIPS 3.0 fans; please post the link to the PIPS 3.0 model data for the last 5 years, so we can see that model’s trends. Question for the PIOMASS fans. If the average ice thickness increases by 15% and you have a recorded short term maximum of area and extent, how do you get a decrease in volume for that month? Shouldn’t the monthly volume be greater due to the simultaneous increase in BOTH of the underlying parameters? You make a blanket statement that he is wrong on Venus and as “proof” link to a page in a book? A page which says little or nothing about it and certainly doesn’t prove anything. A whole raft of criticism from the AGW fanatics above and only one valid question or point to which they offer no real data, ice volume. Btw, Anu, not to fade your laurels or anything, but it is worth wondering, given the closeness of the results you’re pointing at, what impact if any JAXA’s recent change in the May 20-June 11 results could have had here. They did this recently to get rid of the “blip” (which I totally support –it caused the same tiresome question to be asked over and over again about what was causing it). It sounds very much like they replaced a “all on one day” adjustment with a smoothed over several weeks adjustment. It’s not real clear to me what impact that would have relatively. Visually, they appear to have done it to the historical data too, so maybe none. The details are interesting, but not crucial at this point. Too much time is spent attacking data sources – HadCrut, GISS, NSIDC, etc. If we can all agree that Navy PIPS data is OK, then we can start talking about what the data shows, not the “motivations” of the organizations producing the data. Notice that the color scales are different in the PIPS 2.0 and 3.0 images (one steps by 0.25 meters and maxes out at 5.00 meters thick, the other steps at 0.5 meters and maxes out at 8.0 meters thick). I wouldn’t say it is “uniform thickness” in the PIPS 3.o image – the thickness ranges from 0.0-0.5 meters to 3.0-3.5 meters thick. And this was right after the record summer melt of 2007. And which “polar ice group” are you talking about? I wouldn’t say the thickness estimates “seem suspect” – this is Navy PIPS data. As pointed out above PIPS is a model based predictive system. However it can also be used to hindcast the sea ice volume using reanalysis of historic data such as the NAO data. This is evidently how the sea ice volume graph on the retro page of the PSC site was calculated. If we believe it then the 10 % decline per decade of sea ice volume the last thirty years merely melted the volume gained from 1955 to 1969 when the NAO ran negative. It is interesting that the model data predicts that the ice grew at three times the rate during this period compared to the recent (last thirty years) melting rate. The hindcast begins in 1948 but there seems no reason that it can not be hindcast back to the beginning of the NAO data. Looking at the historical data I would estimate that the sea ice volume currently predicted is normal and the sea ice volume melted the last thirty years was unusual in the sense that it resulted from the historic low NAO from 1955 to 1969. Glad that you agree that the PIPS data is a reasonable source for comparison. That makes it possible to have an intelligent discussion. Odd math that is that Arctic ice has rapidly increased since 2007 but you say volume could have decreased. Odd that. You fell in the rabbit hole? It’s hard enough to model the sea ice volume in 2010. I think even sea ice extent is unreliable for 1910 to 1930; even 1955. It’s not so odd. 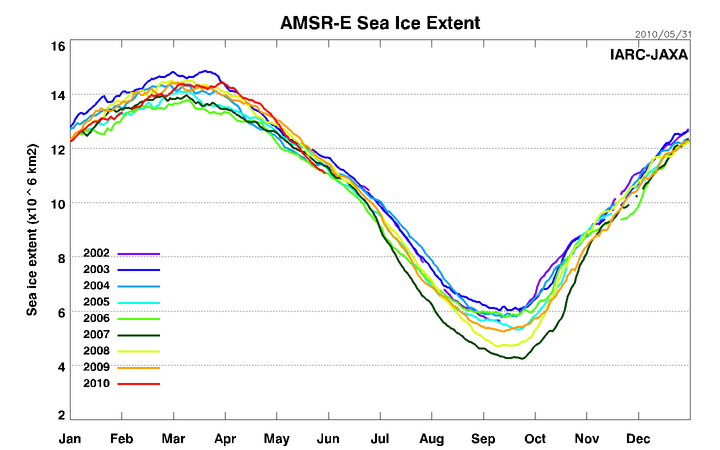 Firstly, the ice area is hardly increasing rapidly: http://arctic.atmos.uiuc.edu/cryosphere/IMAGES/current.anom.jpg ). Secondly, the ice thickness has been falling fast: http://www.arctic.noaa.gov/reportcard/figures/seaice2009fig4.jpg. Hence the total arctic ice volume would indeed be expected to drop. Yeah, a change in algorithm, even a small one, starting May 20th might have given 2010 the edge against 2006. But the interesting facet of the 2010 drop was not the final point in May – it was the fact that it cut across the curves from 2009, 2008, 2003, 2005, 2007, 2004 and 2006 (the 2002 curve did not start till mid-June 2002). Cutting across all the other curves means it was the fastest rate of decline in the fast-melt 21st century data of IARC-JAXA. Of course, if it now tracks 2006, I will lose my next bet, that 2010 will have a lower minimum than 2009. I think you have to put that decline in the context of what happened in late March, which was an unusual “late spurt” in extent growth. IMO, what we’ve seen since is how ephemeral that kind of late season spurt is. Coming that late, it could not have had much thickness at all –forget “multi-year ice”, this was barely “multi-week” ice! It will be very interesting to see if 2010 can hold the 2006 line for the rest of the melt season, particularly when we get into August. 2010 has more multi-year ice than 2008 or 2009, but unlikely it has as much as 2006 did at this point in the melt season. I did a post a few weeks ago correlating monthly extent with minimum extent. Prior to August, the correlation is essentially zero. Speculating on the summer minimum based on current extent has no scientific merit. The fastest rate of decline based on what comparison? Every May in the record? What about July, when every year has a faster rate of decline than this year did? If you are going to use the term “fastest” you need to qualify “fastest compared to WHAT”. Also, if it crossed the 2006 line, why would it now start “tracking” 2006. Why would it not start tracking some other year? Why would it not continue on at a faster rate now that it has crossed all other lines? Or is it possible that May was an anomolous month and has no real significance? I do not know which it is personally, but your “bet” that the line starts “tracking” 2006 has no real basis, at least as far as I can tell from your post. Anyway, here is MY prediction. The arctic will NOT be “ice free in summer” now, in 2013, or during ANY summer between now and 2040. In fact, Arctic sea ice will not fall below 3.2 X 10^6 sq. km. at any time in the next 30 years. How’s THAT for a long-term prediction? Hits. Page views. This stuff sure seems popular. Look at the comment counts! Plus it provides some wonderful examples of how web-reviewed science can work. In just the past few weeks of examining temperature and Arctic records, etc, the equivalent investigative work of several years worth of dueling peer-reviewed papers has been performed. We’re doing it for the science, man! Can you dig it? Models per se are not bad, the issue is accepting and understanding the simplifications and limitations of these miniature versions of reality, like with the not-quite-anatomically-correct Ken doll. The acronym of “Arctic Ice Death Spiral” is AIDS. This could explain the lack of mentions about AIDS supporters and proponents on the ice threads. The arctic sea ice volume hindcast was compared with IPCC projections in a JGR paper published in 2007. OT understood if not posted but this veteran has had enough of Tamino. So I as a patriotic American and veteran I am a pathological person who tends to commit atrocities and I want to subjugate others. On the other hand if I ask them if they fly a flag on Memorial Day well that is just over the line! Please take a moment to think about who is over the line crazy! Out of respect for the site I won’t “go political” and contribute to getting a political thread derailing these ice comments. I will drop off this link showing an egregious example of such distasteful views that readers may choose to examine. sure Tom, i’ll humor you in your rationale there under the bridge. You’re doing good. the trolls must look to you. Funny how you play with numbers Tom. Lots of “tricks” up those global warming sleeves. My comment was that Arctic ice has increased in volume since 2007. In reply you post a graph showing volume has decreased since 1980. You tried to prove me wrong by changing the time frame. Maybe you thought no one would notice. That’s how the global warming game goes. Which shell is the pea under, hey Tom. I had the pea out in the open. You brought in the shells. You changed it into a “trick”. You learned that from Michael Mann? There is the famous global warming prediction that Arctic ice is in a death spiral. Al Gore said in December 2008 that Arctic ice could be gone in “5 years”. But that ice is heading in the opposite direction. You can throw curves at people trying to distract them from looking at that. But it’s all so lame of you. 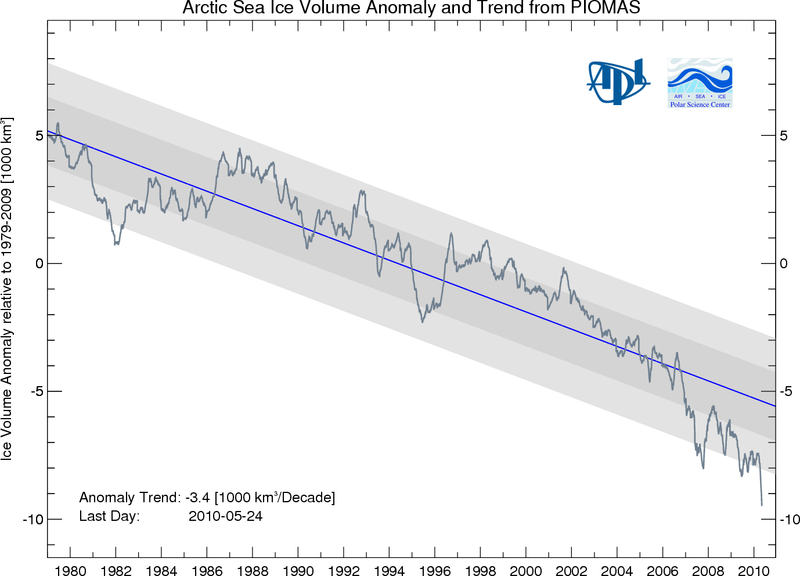 You did know this post is about what’s been happening in Arctic ice since 2007 and how the PIOMAS graph is flawed? Maybe my expectations that you understood that were incorrect.